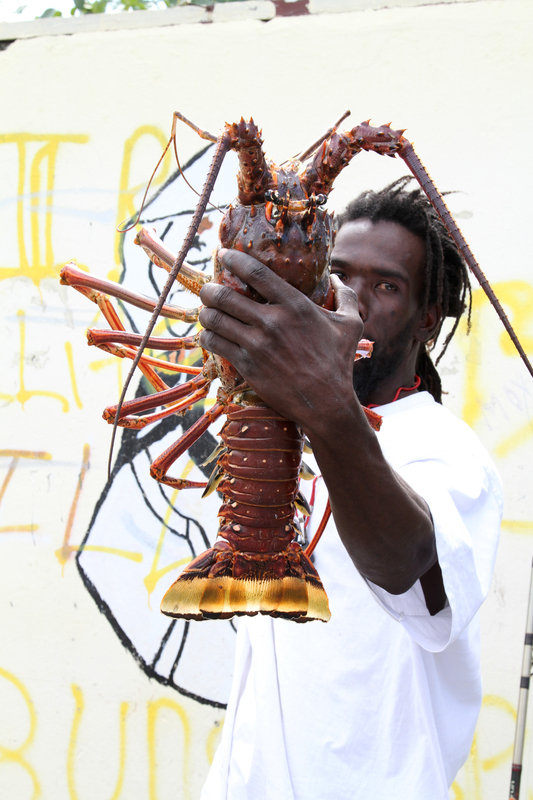 Freshly caught lobster was available at many St. Kitts restaurants. 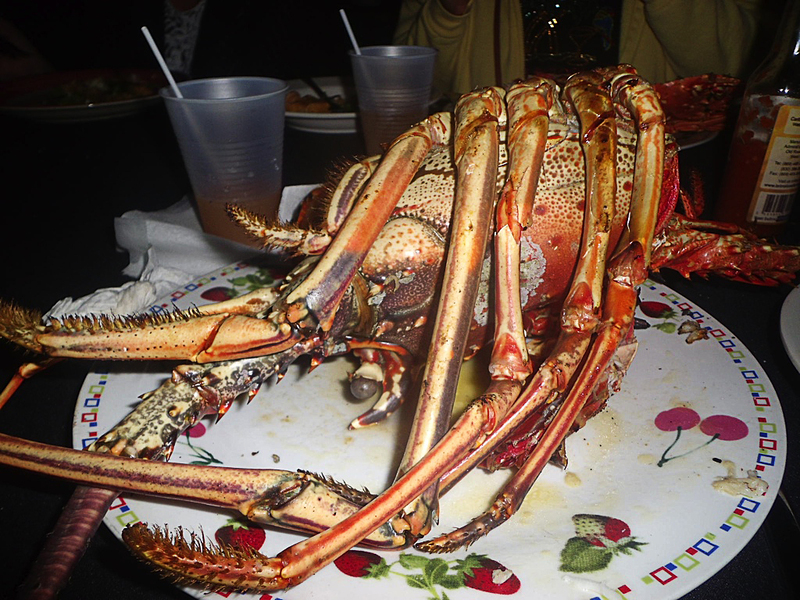 Bill and I enjoyed lobster at three restaurants during our St. Kitts stay: Serendipity, The Beach House, and Mr. X’s Shiggidy Shack. All three restaurants offer beach-side dining. The Beach House is the most elegant of the three (but even so, it’s fine to wear a nice casual shirt and shorts). Serendipity is not as elegant but still very romantic (or, if not in the mood for romance, still a lovely environment where you can watch twinkly cruise ships depart in the night for the next port), and Shiggidy Shack not elegant at all but definitely a ton of fun. From these three restaurants, the lobster was most (very) expensive at Serendipity, next most expensive at The Beach House, and least expensive at Shiggidy Shack. Bill and I had lobster at Serendipity on Valentine’s Day when it was offered as a special entree. We neglected to ask the server the price when she recited the specials to us. It’s probably a good thing, because we are so glad we ordered it, but probably never would have given it a chance had we known the price! We each were served three lobster tails (so…a total of six tails) which made us wonder if we had mistaken the server; we wondered if it was intended to be lobster “for two.” When we asked the server, she said that, “No,” it was meant per person. We had the leftover lobster the next day when we combined it with a Caesar salad for lunch at the beach. If we had it all to do over again, to which of these restaurants would I go? All three of them! For “St. Kitts — Part I” click here. For “St. Kitts — Part II: Vervet Monkeys” click here. For “St. Kitts — Part III: Lobster” click here. For “St. Kitts — Part IV: Caribelle Batik at Romney Manor” click here. For “St. Kitts — Part V: Mr X’s Shiggidy Shack” click here. For “St. Kitts — Part VI: Brimstone Hill Fortress” click here. For “St. Kitts — Part VII: The Beach(es)” click here. For “St. Kitts — Part VIII: Plant Life” click here. For “St. Kitts — Part IX: Miscellaneous” click here. This entry was posted on March 3, 2012 at 10:03 pm and is filed under St. Kitts, Travel. You can follow any responses to this entry through the RSS 2.0 feed. You can skip to the end and leave a response. Pinging is currently not allowed. Wow, huge lobster. My mouth is watering! Malou and Marti, thanks for your comments. The lobster WAS pretty amazing, both in this photo and to my taste buds! The only pricing for the lobster (that we ate, anyway) that gave us sticker shock was at Serendipity. If I had it to do over again, I’d order it again because it was so good, and lasted for an extra meal for each of us. But, yes, a pricy dish to have!